When I was a kid, my mom used to take us to the farmers' market on the weekends. We'd roam around, sample anything and everything, and pick up groceries for dinner. It was always a delightful experience, until one dark and tragic day I can remember so vividly it hurts me to type this. I spotted the carrots from across the market. Big, pointy at the end, and they HAD THE GREEN TOPS STILL ON. Just like Bugs Bunny. Just like you see in the movies. Oh my god. I was so excited...I was raised in the era when mini bagged carrots were all the rage and they on no level resembled those that were consumed by Bugs Bunny. I didn't even realize garden carrots really existed. I was really young, btw (I think?). My mom, being the generous farmers' market-goer that she was, happily obliged to buy me a bunch. Yay! Best day ever. But after we bought them, the dreadful carrot man took the green tops and CHOPPED THEM OFF, right before my eyes. !!!! Why??! What cruel man would do such a thing? Talk about taking the wind right out of my sail. That is one of my earliest, bad memories I have as a child. Which, now that I say it out loud, means I was a pretty lucky kid if that's as bad as it got. Anyway... today, I am keeping the tops on. 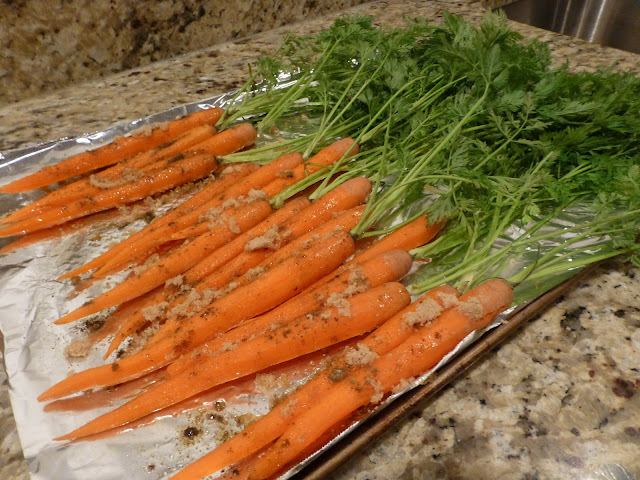 Lay the carrots on a baking sheet, drizzle with oil, sprinkle with cumin, brown sugar and salt. Cover the green tops with aluminum foil, otherwise they will burn off. 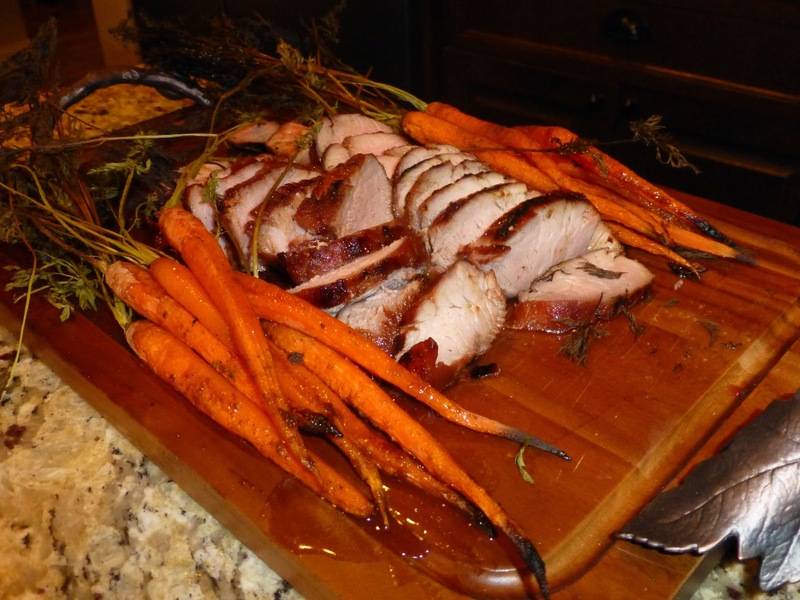 Roast at 400 for about 25-35 minutes, depending on carrot size, until they are caramelized and fork tender. Now try one, and tell me you're not having more fun eating it with the leafy top still intact. You can't do it, probably.